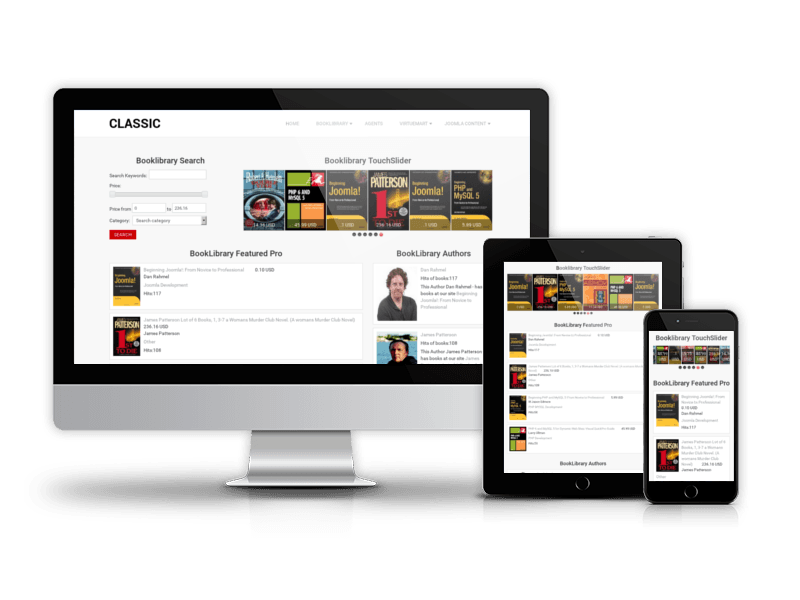 Classic Book Library is online library website template built on Book Library - perfect Joomla solution for libraries management. This online library Joomla template will be useful as a starting point for creation e-library, online book collections, bookstores, libraries, bookshops, store of digital products, eBooks, digital libraries and also books linked to Amazon. In Quickstart package of Classic Book Library template were included Book Library component as well as all necessary modules to build full-functional book collection website: BookLibrary Featured Pro (allows to display last added, most popular or featured books), BookLibrary Featured Authors Pro, Booklibrary Search module PRO, Booklibrary Touch Slider Pro, Booklibrary Authors Touch Slider Pro. Moreover Simple Membership Pro for creating premium (paid) subscriptions is also in package. Entire Quickstart package can be installed just in few minutes. Classic Library Joomla template is compatible with IE 9+, Firefox, Chrome, Safari and Opera and comes with responsive design to be viewed from mobile devices and tablets. Customize easily existing Classic Library Joomla template using powerful features and elements of Joomla Blank template. You can change Fonts (27 font styles), style of links, upload your logo, moreover you can easily insert copyright and Google tracking code via Joomla admin area. Check out the demo version to see all robust features of library website template and create your own online library. Also some other awesome book library Joomla templates are available. Classic Book Library template fully compatible with all browsers: Chrome, Firefox, Safari, Opera and Internet Explorer 9+.